PARADOXALEMENT D’ISOLER CE QUI EST PROPRE AU JEU LUMINEUX D’HAROLD VICK. CET ALBUM DESSINE EN CREUX SA TRÈS SINGUIÈRE PERSONNALITÉ. Harold Vick’s saxophone and flute paying is just in between hard bop and soul jazz, he is usually very well known for having played as sideman with Grant Green, Jack McDuff, Jimmy Smith or Shirley Scott. But Vick has also played with mainstream legends such as Aretha Franklin, Dizzy Gillespie, Mercer Ellington and Sarah Vaughan. 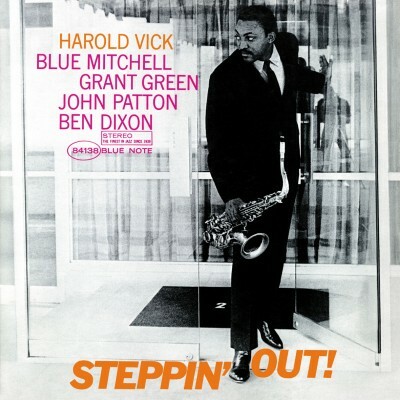 In 1963, he is 27 years old, and “Stepping Out” is his first album as a leader and the only one recorded for Blue Note as the following albums will be recorded on RCA and Srata East. A quick exam of the list of musicians gives the impression that Vick Harold is taking the place of Stanley Turrentine as he has almost the same group of sidemen : This quintet is formed by Vick himself to which are added trumpetist Blue Mitchell, guitarist Grant Green, organist John Patton, drummer Ben Dixon. We can clearly and immediately identify what is very personal in Vick’s playing and style. If we add that on six track, 5 are compositions by Vick Harold, four are composed on a blues structure, all this results in a very personal masterpiece.